The Ancestry Insider: Is your society website doing all it’s cracked up to be? Is your society website doing all it’s cracked up to be? 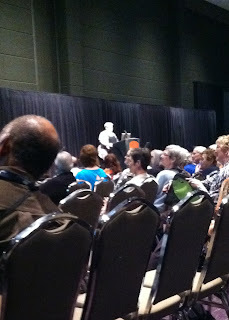 “Is your society website doing all it’s cracked up to be?” asked Cyndi Ingle Howells in the opening session of the Federation of Genealogical Societies 2013 annual conference on Wednesday. Wednesday is Society Day and sessions are targeted to societies. General sessions begin Thursday. Howells is the creator and owner of the award-winning website Cyndi’s List of Genealogy Sites on the Internet, a categorized index to more than 327,000 online resources. Howells, a genealogist for more than 31 years, is an internationally known guest lecturer for various genealogical and historical society conferences and seminars. “I’ve seen them all, the good, the bad, and the ugly,” she said. Her website lists several thousand society websites and she’s looked at every one. Ask yourself, “Is your society doing what it needs to do to reach its goals?” A website can serve several different tasks for a society. It can be a flyer, a newsletter, a publication, a store, a portal to other related resources, an archive of education, and other things. “Look at your website again for the first time,” said Howells. She gave many tips on what to look for, more than I can repeat here. “A website needs to be maintained,” she said. “A website needs to be updated. A web site needs to be active.” Ask yourself when you last updated your website. It should be at least monthly. Howells prefers weekly. Make certain you have a webmaster and oversight by a committee or the board. Take advantage of social networking to reach new and younger people. Make the name of your society obvious. Remember that search engines can’t read graphics, so don’t limit statement of your society name to a logo graphic. Specify where your society is located. State your society mission. Avoid gobbledee-gook: (Did I spell that correctly?) animated graphics, music, multiple fonts, overly long page titles, and other “garbage.” Use dark text on light background. “Make it work the way it needs to,” said Howells. Access Cyndi’s List at http://www.cyndislist.com/. Get rid of music! I left a promising site the other night because I couldn't turn off their choice of music.